Hazel Dicken-Garcia, who joined the University of Minnesota faculty in 1979, retired at the end of the 2007-08 academic year. Known for her extraordinary commitment to her students, Dicken-Garcia made an indelible mark on the School of Journalism & Mass Communication (SJMC) and has been one of this country's greatest contributors to the field of journalism and mass communication history. She has published extensively on the history of journalism, and her book, Journalistic Standards in Nineteenth-Century America, received the Kappa Tau Alpha Award as the best book published in the field in 1989. Most recently, she co-authored Hated Ideas and the American Civil War Press with her former advisee Giovanna Dell�Orto (Ph.D. 2004). 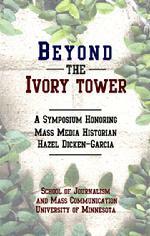 On Sept. 19, 2008, the SJMC hosted a symposium in Dicken-Garcia�s honor at the University of Minnesota. Some of her former advisees presented papers on the topic, Translating Ivory Tower Scholarship into �Real-World� Action. This book, published by the SJMC in recognition of Hazel�s career, includes these papers and other contributions.